Like most people in the entire world I am busy. But the Fall season is by far the busiest for me. From September to January I’m insanely occupied�with back-to-school, my husband and 2 daughter’s birthdays, Halloween, Thanksgiving and Christmas. And like most people on this planet I’m always biting off more then I can chew. I have so many things I want to do in relation to my love of knitting. I never tire or bore of it. It’s a never-ending universe of fibre, needles and warmth. What I’m trying to get at�is I’m behind in posts and getting the Honeybee project pattern written. My apologies but I can’t reveal it until next week’s post. I have instead three cell phone stand bags. The first two are complete and blocked. The third one in grey and yellow needs blocking and a button sewn. 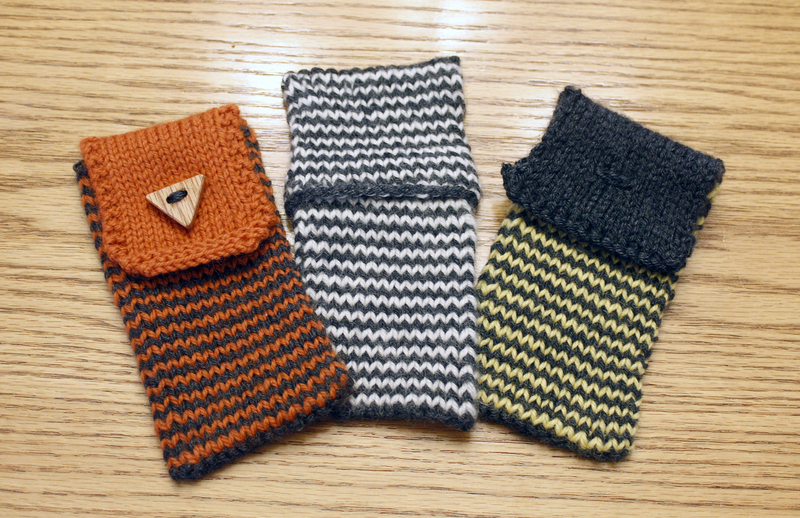 I double-knit the flap on the grey and yellow one so it looks way more finished then the orange and grey one. I’m going to be the queen of double-knitting when I’m done all these bags. Well okay maybe not queen – that title probably belongs to Lucy Neatby. In other news, I joined the Kitchener-Waterloo Knitter’s Guild and attended my first meeting. It was amazing being in a room full of knitters and chatting about knitting. I can’t wait until the next month’s meeting and I hope to become more involved in the fibre community of my lovely city. And finally I signed up to help out Knitty by becoming a patron. For a few bucks an issue I’m helping them grow as a great online knitting pattern magazine. One of these days I’m going to get around to submitting a pattern or five to them. I dream of day when I can get some of my designs publish. Next: Honeypot Hat is here!